I woke that day, curled up in my sleeping bag in the dirt lot of the Cooke City dump. When I rolled over, frost fell onto my face. It must have been 7:30, and it was mid-April, but it had been a cold night. Josh got up and brewed hot water, then Kyler, Ty, then me. Then we were all up, hopping around and putting on layers, rubbing sleep from our eyes. We hovered over the single cup of French press and stuffed sleeping bags, looked at frozen ski boots. I slept with my liners and was feeling smug and content–until Erik pointed out the ten-inch-long Grizzly tracks circling our slumber party, five feet from my head. We drove into town and walked blindly into the warmth of the Buns and Brews. With a draft of local chatter, more coffee, and a chocolate chip cookie each, we were fueled for the ride into Yellowstone. Soon, we were crust-cruising toward Abiathar Peak’s north couloir. 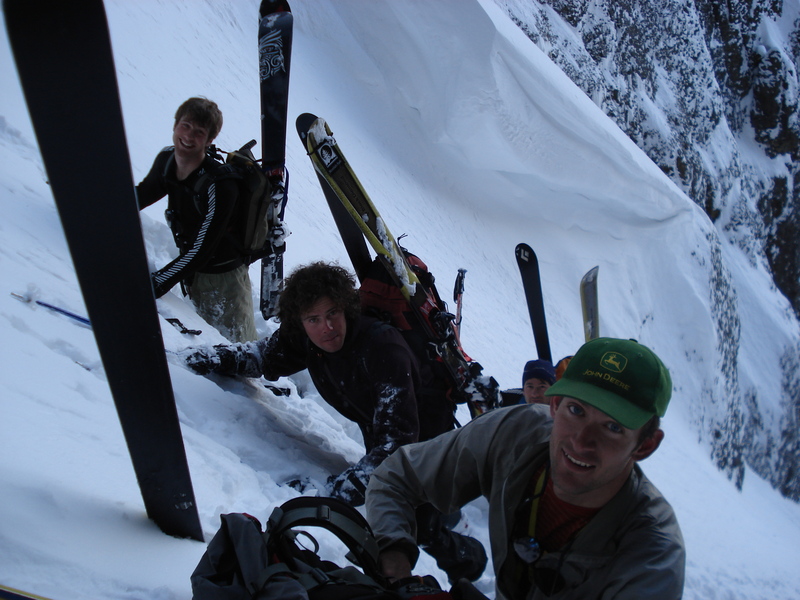 Two hours of easy skinning put us below the chute, a gash in the mountain that stopped halfway and wouldn’t reach the summit cleanly with skis. Skis on packs, booting. Smooth conglomerate walls darkened the sky, and warming slough cascaded from the hanging snowfield above. 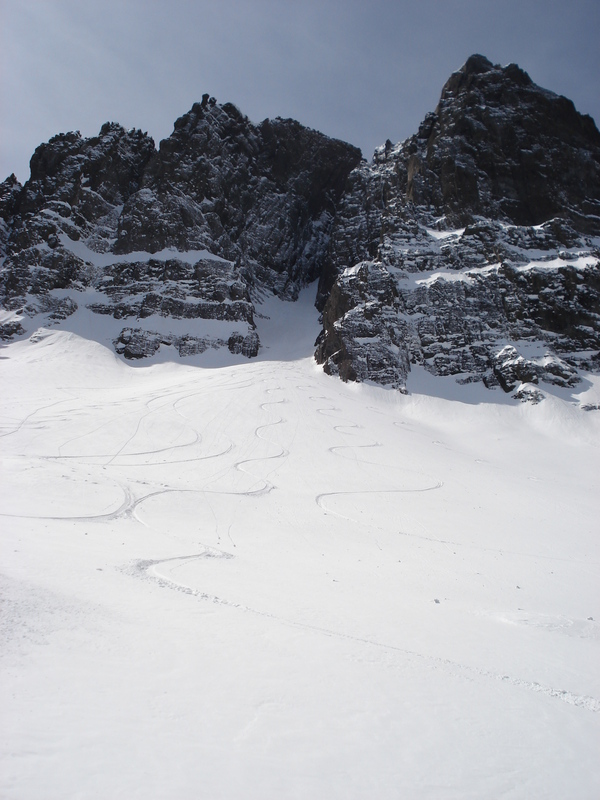 Kicking through wind crust, then powder, we slipped, but made progress. Finally, my turn to lead came, and I got the last, steepest shot. 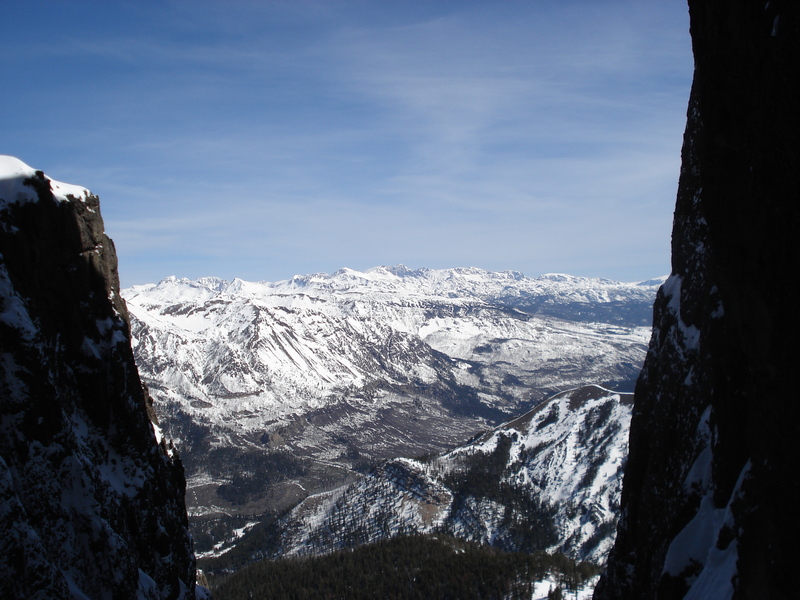 The chute ended in a rock chimney and an exposed snow traverse out right to easy fifth-class climbing, dubbed the “AC traverse” by its first ascentionists. We stopped there. The snow in the chute was chunky and breakable, and my knee felt unstable. I crashed. The apron was smooth as butter, so we laid tracks of every size; the last of a season’s artwork. On the bushwhack-ski out I almost got devoured by two-foot deep isothermic crap snow. Just get to the truck and the season is over. Before this, it was eight months of knee surgeries and recoveries. Five hours after leaving, we were yard saleing in the parking lot. 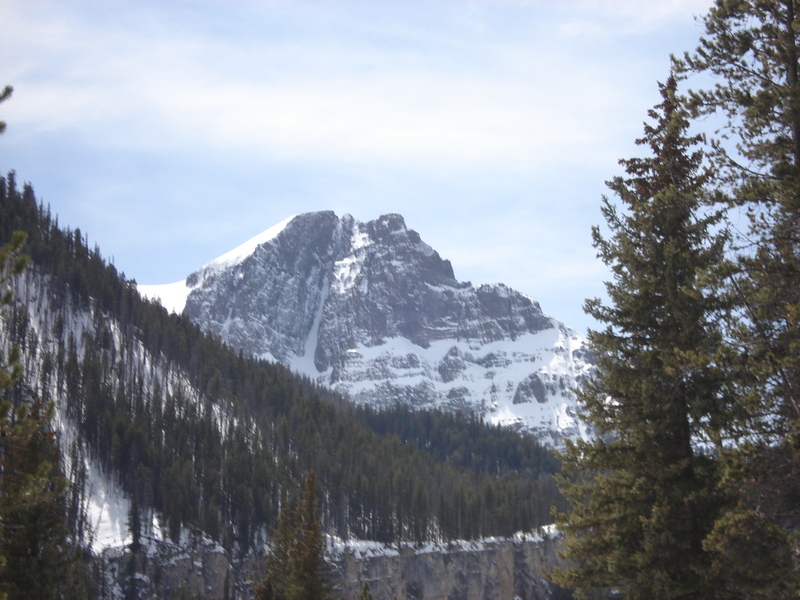 Peaks and chutes reflected bright white in the sun; evergreens and cliffs hugged a burned hillside of black standing dead; snow and sky on mountains. Next stop, Boiling River. This entry was posted in Back in the day, Montana, Mountains, Skiing, Uncategorized, Videos/sound and tagged Abiathar. Bookmark the permalink. Emily – great stories – I’m a friend of your Dad’s from Essex Junction and recently relocated to SLC with my family. Please tell him to come and visit and in the meantime I’ll be watching your posts.